That’s why Don Harrison, IMA President, believes it is absolutely essential for us to embrace Next Generation Change Management so that we deliver the maximum impact in the shortest amount of time. Traditional Change Management may have been good enough a few years ago, but now it is time to move on. Don pinpoints the following 8 trends that will lead an organization into the Next Generation of Change Management. Many Change Management Methodologies are activity based. The focus is on a lock-step protocol where a Change Agent goes through a set of forms and checklists “to do” Change Management. This will certainly keep Change Agents busy, but with today’s rate of change, organizations can’t afford to have resources spend time on things that are not delivering value and do not make an impact on the bottom line. In Next Generation Change Management, resources are intentionally targeted and Change Agents use their skills on interventions that will drive speed. As part of his ongoing field research, Don noticed organizations were solely focused on getting their initiatives to launch or “go live.” What these organizations didn’t understand is that while getting to launch is important, it is not enough. When a project’s endpoint is declared at the point of cutover (what he likes to call premature project completion) the key resources necessary to get to sustained behavior change are assigned to the next project. It may look like change, but it’s change only at the surface level. When behavior doesn’t change, there is much more limited Return on Investment. It’s the difference between Installation vs. Implementation. In Next Generation Change Management, a project isn’t deemed complete unless it is delivered on time, on budget, with all business, technical, and human objectives met. Change Agents must have a high level of trust with both the Sponsors and the Targets of a change. Trust and speed are functional. The higher the level of trust, the greater the speed of implementation, and the fewer resources needed. Next Generation Change Management is an exercise in power and politics, where influence is used to achieve the needed business results. For this reason, skilled project leaders employ three kinds of resources: SME’s who are the technical experts, Change Agents with strong relationships (trust and credibility), and Change Agents with implementation expertise. Sponsor Contracting is an exchange of offers, wants, and needs that ensures Sponsors are clear on what is expected of them at critical points in the project lifecycle. While chartering is at project launch, contracting continues on throughout the project. 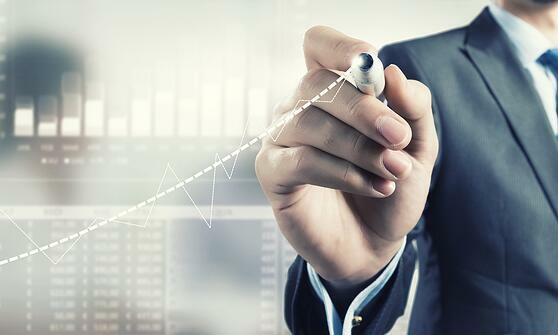 Chartering addresses the technical elements of the change, but does not identify the behavioral objectives needed to achieve all the success metrics. Change Agents who are skilled at Sponsor Contracting are better able to work with Sponsors on those Express, Model, and Reinforce actions that move the project from Installation to Implementation. Whether your organization uses Agile or a Waterfall approach, the end goal is benefit realization. Project Management helps ensure a project is on time, on budget, to scope. Change Management is the process, rigor, and discipline for the people side of a change. In Next Generation Change Management, the principles, tools, and deliverables of Change Management are blended with Project Management from the start in an integrated effort to achieve full benefit realization. In Next Generation Change Management, actions are centered around delivering value through focusing on those actions that drive behavior change. Therefore, much more time is spent “looking up” the organization rather than “looking down,” especially at the beginning of the project. Resistance is a function of the level of disruption of change. It is how people protect themselves against changes in behaviors, reinforcement, work characteristics, power and/or status. In any change, you have two options: You can either invest in Readiness, or spend your resources managing resistance later. In his 4 decades of work, Don has yet to see another viable option. Is it better for a Change Agent to spend time working on a Communication Plan or with a Sponsor on a Reinforcement Plan? A Communication Plan is important, but nobody changes their behavior just because an email went out saying they should. 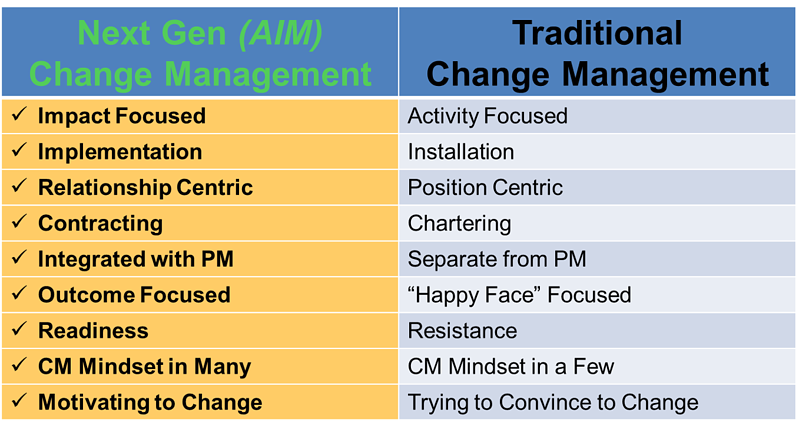 One of the core principles of AIM states, “If you don’t change the Reinforcement, you don’t get the change.” If you want to motivate people to change what they are doing, you have to alter the Reinforcement. In the past, it was good enough to just tell people what they needed to do, and they would do it. Those days are gone, and if your organization wants to retain its top talent, then applying the appropriate Reinforcements is the most efficient way to achieve the needed behavioral changes. How do you manage the constant churn of change? And how do you do that with limited resources? Don Harrison developed the AIM Change Management Methodology to guide you on what to do given the day-to-day realities and challenges of a project. It is Change Management for the Next Generation.